a second, small flash drive (1 gig is more than enough. 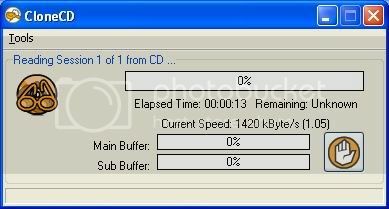 I actually used an old 128MB SD card, which works fine on the 10v--not on the Mini 9 as far as I know). This will download a zipped folder. Open it, and drag the file contained in it to your desktop for easy access. Now we can get started. 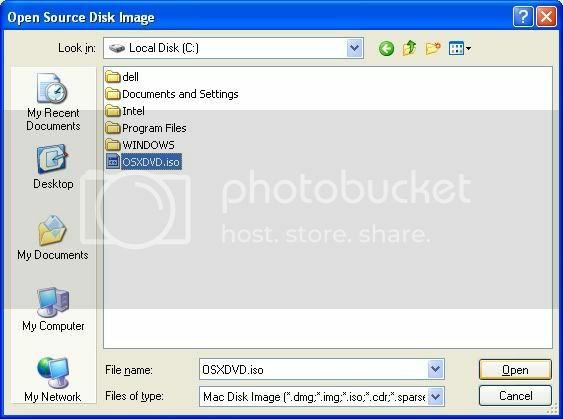 Insert OS X DVD into your PC's DVD drive. 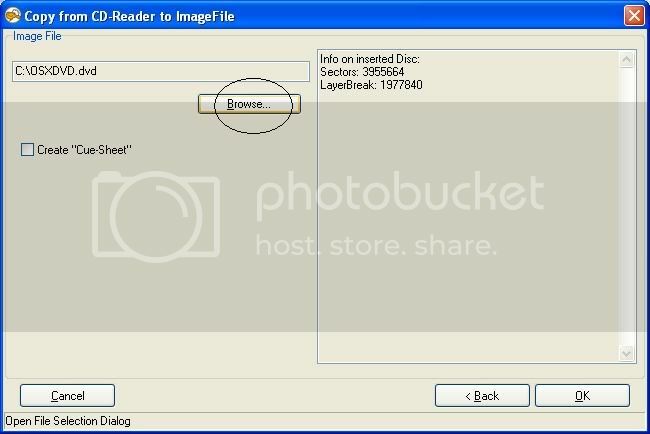 Open CloneCD, select the first option "Read to Image file"
Name the file something appropriate, and choose Image, in the "save as type" field. this will take about half an hour. Once CloneCD is done, it will eject the DVD, and give you a musical prompt. Click OK, and close CloneCD. CloneCD creates two files. One will be a .iso file-- that's the one that matters. The other one is a .DVD file, which we're not concerned with here. 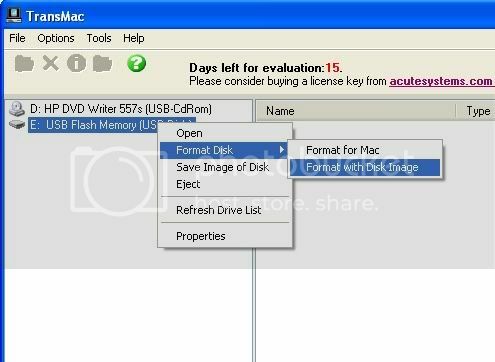 Now, find your 16 gig flash drive, and insert it into your PC's USB port. 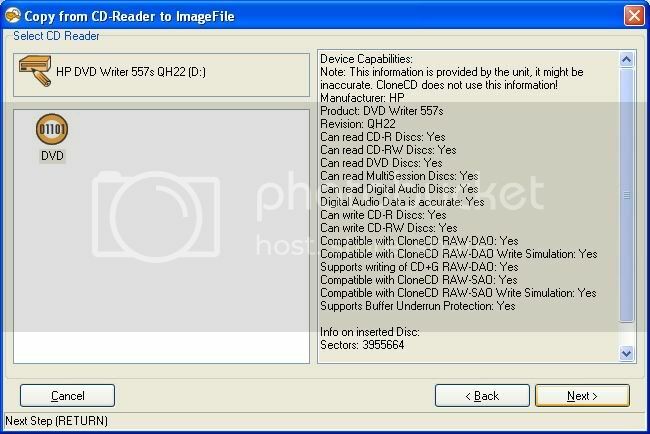 You will see your USB Flash drive listed on the left side. click Open. 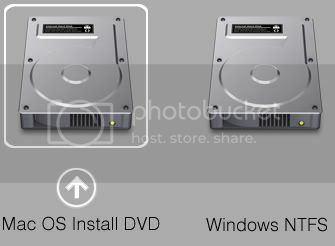 Transmac will now write OS X Install DVD to your flash drive. this will take about an hour or so, time for another break. You will not be prompted when writing is complete. The progress bar dialog will simply close. Once that happens, remove the 16 gig drive, insert the small flash drive and repeat the process with the NBI file you placed on your desktop above. Note: if you don't see the file right away, change the "Files of type" field to "all file types," and you'll then see the .img file. The NBI will write in a few minutes. **Now you can Take these two Flash Drives, connect them to your Mini, and run the install. If you want to continue using Windows on your Mini, consider Dual Booting. It's best to boot your Mini with just the smaller flash drive first so it will recognize the bootloader-- let it run until you see the Windows NTFS hard drive image. Turn it off, and boot with both Flash Drives. 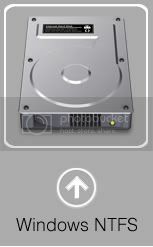 Now the OS X install drive will be recognized as well. First you will have to make a few changes to your Miniâ€™s BIOS. Turn it on, and get into the BIOS settings. (On the Mini 10v press F2). USB Legacy Support and Bluetooth should be enabled. USB Wake Support should be disabled. Use the arrow keys to highlight, use F5/F6 to toggle â€˜enable/disableâ€™. Press (F10) to save the settings and Exit BIOS. Turn off the Mini. With the Boot USB connected to one of the Miniâ€™s ports, power it up. 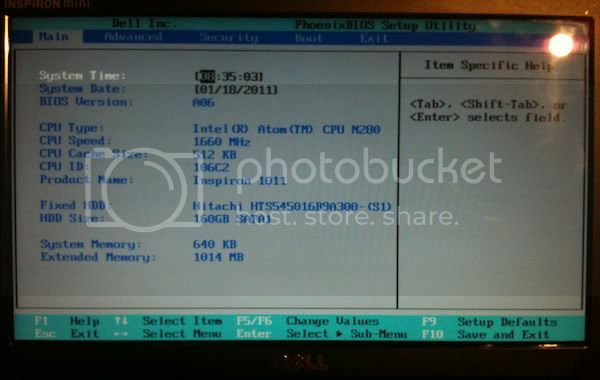 Press F12 to select the boot order in BIOS. 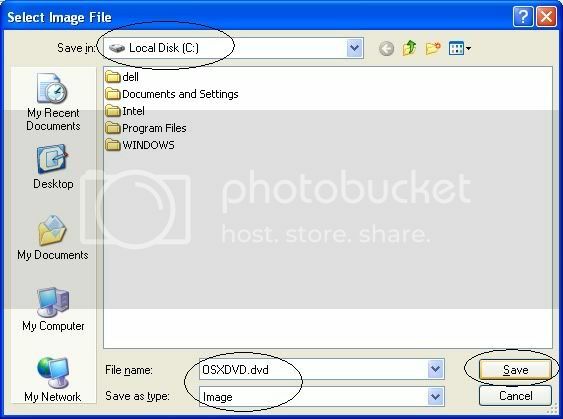 Highlight USB Storage and hit enter. If the boot-loader on the USB drive is recognized, you will see an icon representing your Miniâ€™s hard-drive in the center of the screen. Shut down. If the boot-loader is not recognized, your computer will boot normally. Shut it down and retry to start up to the Boot USB, it may take you a few tries. 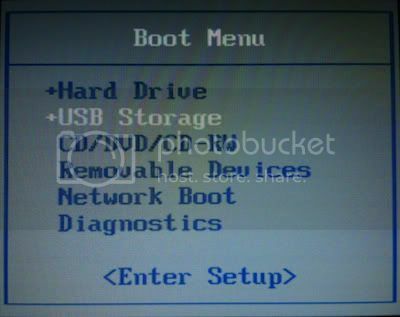 When you see the boot screen, your Boot USB has been recognized. This screen will show your Mini's partitions (including your OS, recovery, and any other partitions you may have created yourself). Leaving the Boot USB connected, also connect the OS X Install USB and power up. Press F12 to get into the BIOS boot screen again, choose USB, press enter. Now you will see the Install USB as a startup option, as well as the your Miniâ€™s internal drive. Use the arrow keys to select the Install USB, press enter. The installer will take a few minutes to load. Once it loads click through the first three screens; a language selection screen, an information screen, and a license agreement screen. After that, you will see a drive selection screen. This screen will show your available drives. From the task bar, choose Utilities/ Disk Utility. Select your internal hard-drive. From the right, click the erase tab. Select Mac OS Extended (Journaled) as the format. Click erase. A warning dialog pops up, click erase to confirm. 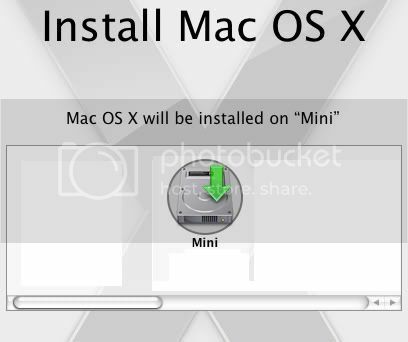 This will make your Miniâ€™s drive available to install OS X to. 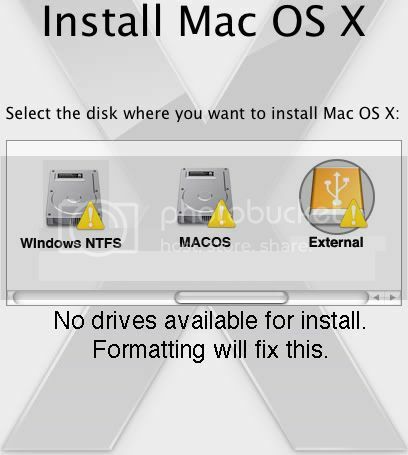 When formatting completes, quit Disk Utility, and select the newly formatted drive to install to. Click install. Note that you can customize your installation. Installation will take about an hour, so take a break. When it completes, your mini will restart and boot you into Mac OS X. You may have issues with sound, wifi, and bluetooth not working properly. Usually running NBI again will solve this. There should be a copy of it in your applications folder. The usual update path is : run NBI / do the update / Run NBI again. If you have persistent issues with sleep, bluetooth, or sound, read the respective threads. Also read the update threads carefully as the update experience varies for different users, ranging from painless success, to frustrating failures leading to non-booting machines. Back up before attempting updates. I wish you much success. Nice tut. Can you show how to dual boot xp and 10.6? thanx! Does this work on a mini9 atom processor? I think I read that 10.6.2 broke support for atom processors, does this method work around that? and a thumb drive with a retail 10.6.0 on it? i'm using a mini 10v, also with atom processor. so i'd imagine this will work for you as well. I hope someone else can verify that. Installed 10.6 (custom. I unchecked everything except the core OS in the customize tab) My install USB was prepped with NBI 0.8.4 RC1, so, if yours is not, you may want to fint that NBI, run it and reboot. without rebooting, I ran Software Update, and ran only the OS Update; no itunes no security update, or anything like that. Ok, so i thought you had a copy of 10.6, from which you had prepped the drive already. got "unable to patch 64 bit kernel" error to start with so plugged in the 16gb usb stick rebooted and everything worked fine. now what to do with it now its installed. Pretty painless after all, wasn't it?